The Japanese are known for their skin-brightening products for fairer, brighter, healthy- and translucent-looking skin (sorry, not really that bleached, beached whale kind-of-white that some might assume Chinese/ Korean/ Japanese women want to have). As summer comes round, and the sun’s rays are at its strongest, Kose launches its latest trio of skin-illuminating skincare products. The latest version of the Whiteologist Bright Express Brightening Serum contains a proprietary active complex (comprising of seaweed extract, Japanese honeysuckle, saffron, mallow, wild thyme, glycerin, and kojic acid) that disperses melanin clusters. This helps to prevent melanin from becoming dark spots on the surface of the skin. This clear serum is very watery, so use it after an essence and before a more viscous serum. Perfect for layering of skincare. The serum now comes in a limited edition fancy silver 60ml bottle worth $260, and retailing at $330. Available at Cosme Decorate counters in Singapore. You can use all the skin-brightening serums you want but skin will not stay fair if you do not use a good sunscreen on a daily basis. The two new ones from Kose are excellent choices. The Decorte Sun Shelter Multi Protection Sun Screen SPF 50+ PA++++ ($44/ 35ml) is a creamy and moisturising broad-spectrum formula that also protects skin from pollution that can irritate (such as PM2.5, fine atmospheric particulate matter with a diameter of less than 2.5 micrometers). Made with rosemary leaf extract and water, collagen, glycerin and tocopherol, it leaves skin with a nice suppleness; making it ideal for use as a make-up primer too. 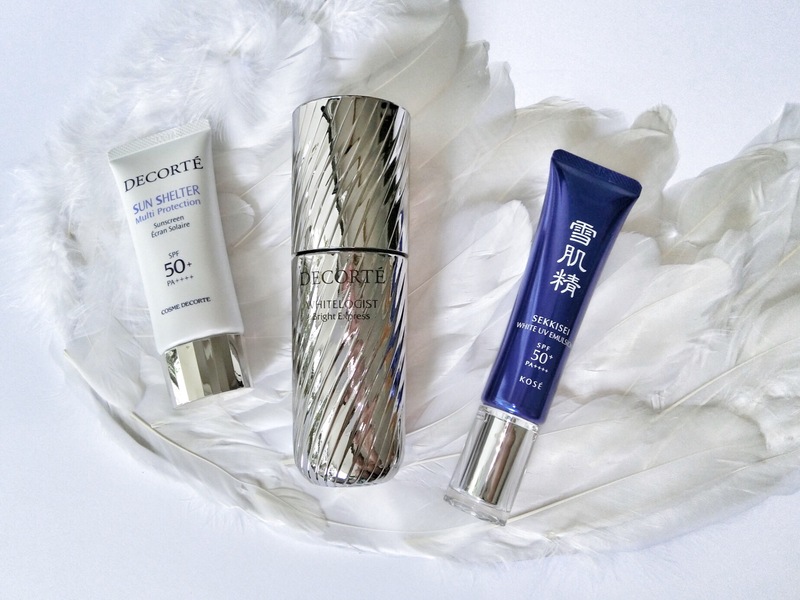 While the Kose Sekkisei White UV Emulsion is best used if you want a multi-tasker that brightens while it protects skin from the damaging UV rays. Formulated with coral grass extract that strengthens skin so it is less prone to irritation and dehydration; fermented coix seed extract; as well as angelica and white lotus for brighter and moisturised skin. It absorbs into the skin in a flash, and is long-lasting. I think it is most suitable for oilier skin types, and those with active lifestyles.